At first glance it would be easy to assume that offense was in abundance for the Mililani football team in its 49-7 runaway win over host Kapolei Friday night. In actuality, however, the Trojans' prolific offense sputtered out of the gates and it was it their defense that provided the spark that led to a 35-point second quarter. Despite putting together a couple of long drives on its first two possession, Mililani turned it over on downs both times after failed conversions on pair of fourth-and-10s, but it's defense made sure the early miscues did not hurt, forcing two quick three-and-outs in response. The Trojans' third drive got off on the wrong foot when quarterback Dillon Gabriel was sacked for a 7-yard loss on the first play and a 46-yard pass to Maka Hill was negated by a holding penalty one play later. They eventually were relegated to a Cy Kuboyama-Hayashi punt, which was returned by Kapolei's Landan Shove across midfield to the Mililani 49-yard line. The Hurricanes had their best starting field position of the game and picked up their first first down with Mason Gomez's 15-yard completion to De'Zhaun Stribling to move the chains on a third-and-2. But just when the home team appeared to be picking up some momentum, the Mililani defense made a key play. On a second-and-8 at the Trojans' 24-yard line, defensive end Shane Kady closed in on Gomez and stripped him of the football and his teammate, Mykah Tuiolemotu recovered the fumble for the game's first and only turnover. "I just did a speed rush and I just saw the QB with the ball and I just tried to knock the ball out," said Kady, a 6-foot, 3-inch, 195-pound junior. Kady, who has six sacks on the season, said the defense took it upon themselves to get things going to help out the offense. "Yeah, definitely. I mean, our offense they looked like they weren't feeling the game at first, but then our defense really held it down and just worked as a team," Kady said. Mililani coach Rod York said the offensive struggles were largely self-inflicted. "We dropped maybe five passes — two of them were touchdowns — and then we got a couple holding penalties," York said. After the takeaway the Trojans responded on offense with a 12-play, 70-yard drive that was capped by Kilifi Malepeai's 2-yard plunge into the end zone four plays into the second quarter. 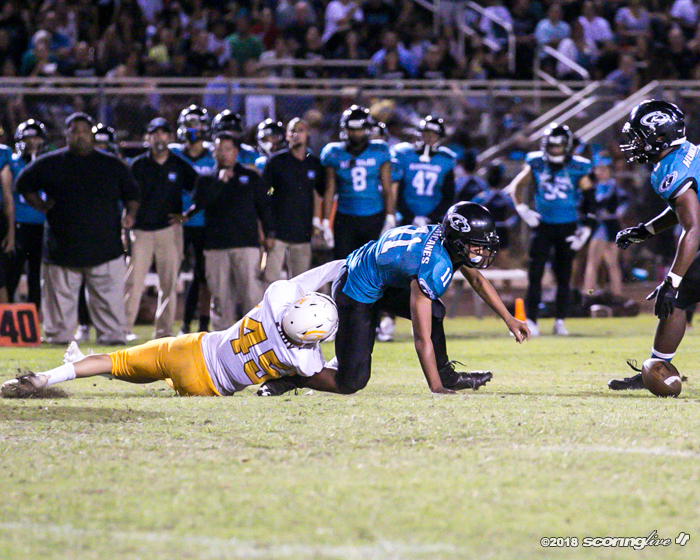 "It was important for them to stop the rally for Kapolei," Hill said of the defensive effort. "They just had to keep the momentum down and then when (the offense) started to click we just had to keep that up." Both sides of the ball did their part. The defense turned in four consecutive three-and-outs and the offense capitalized on the superior field position more often than not. Gabriel hit Hill for touchdown passes of 9, 38 and 3 yards and Malepeai added a four-yard TD run on Mililani's final four drives of the first half to take a commanding 35-0 lead into the intermission. "Defense played lights out, that's why we're winning games," said Gabriel, who finished 21-of-36 passing without an interception for 248 yards. The Trojans added a pair of early scores in the fourth quarter with its reserves in before Kapolei got its only score of the game in the closing minutes. The Hurricanes were held to 158 yards of total offense. They averaged only 4.6 yards per pass attempt, 2.2 yards per rush and managed only eight first downs — all but two of them coming after halftime. Since allowing 52 points in a road loss at national powerhouse St. John Bosco (Bellflower, Calif.) and 43 points in a home defeat to Punahou, Mililani's defense has buckled down and allowed a total of 31 points during its current four-game win streak. For the season, the Trojans are holding opponents to 19 points and just under 259 yards per game. Just when it seems it is hitting its stride, however, Mililani (7-2 overall, 5-0 league) — which has locked up the top seed in the four-team OIA Open Division playoffs — now faces a long layoff before opening postseason play the weekend of Oct. 26-27. "it's not like we haven't been there before, so we just gotta use that time wisely; reset the mindset," York said. York's players are of the same mentality. "With a long break like that, yeah, there might be some laziness or sloppiness, but I think that we've built up enough confidence and we work hard enough that we'll be ready when we come out of our bye," Hill said. Kady agreed, adding that overconfidence isn't an issue after the back-to-back losses to St. John Bosco and Punahou back in late August and early September, respectively. "We definitely got a spark now, but I feel like we're just gonna go to practice and just work hard and continue," Kady said.